Notice! Palm Wings Beach Resort Spa does not accept reservations at this time. Please try again later. Palm Wings Beach Resort Spa Contact. If you are looking for the green of nature, the peace and quiet of the Aegean at your holiday this is the right choice. Palm Wings Beach Resort is located in Altinkum Didim, one of the most beautiful holiday resorts of Aegean, to serve you. We are waiting for you to welcome our guests with our blue flagged beach of 120 m length. Our hotel is built on 100.000 m2 area and we serve our guests with 24 Hours All Inclusive concept. In the rooms of our hotel which appeals to those who want to live every aspect of holiday village privilege; balcony, terrace, room service, air conditioning, safe deposit box, television. Our hotel also; wireless internet, hairdresser, massage, fitness center, children's pool, playground and water slide. In our hotel where you can have a family fun holiday, you can enjoy sea, kumun and sun while your children are having fun in mini club, you can relax in SPA center. You can have fun on the beach with water sports such as banana, sea bike, jetski, canoe, catamaran, surfing. For our adventurous guests we have a parachute and surfing opportunity. You can also enjoy a game of billiards at our hotel. At our a la carte restaurants you can taste the unique tastes of seafood, Italian, Turkish and Indian cuisine, and discover the finest examples of Chinese cuisine. 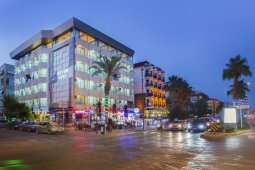 Our hotel is within walking distance to the center of Didim Altinkum and 4 km from the center of Didim. Our hotel is located on the seafront, with a pier, a sunbathing platform and a blue flag beach with a length of 120 m waiting for you. Also on the beach; sun beds, umbrellas, mattresses and beach towels are offered free of charge to our guests. Our hotel shares all the possibilities for you to have a pleasant time. Your room temperature can be adjusted with central air conditioning / split air conditioner. The TV, telephone and room kiosks you can use during your stay are served as standard rooms. If our hotel can not provide the necessary accommodation, we have the right to change the concept or concept. Palm Wings Beach Resort Spa accepts VISA and reserves the right to temporarily hold an amount prior to arrival. Palm Wings Beach Resort Spa accepts Master Card and reserves the right to temporarily hold an amount prior to arrival. Palm Wings Beach Resort Spa accepts Maestro and reserves the right to temporarily hold an amount prior to arrival. Palm Wings Beach Resort Spa accepts American Express and reserves the right to temporarily hold an amount prior to arrival. Palm Wings Beach Resort Spa accepts Bank card and reserves the right to temporarily hold an amount prior to arrival. Palm Wings Beach Resort Spa accepts ATM card and reserves the right to temporarily hold an amount prior to arrival. Free buffet meals in the morning, lunch and dinner. Some local alcoholic and non-alcoholic drinks are free 24 hours. Minimum 5 nights accommodation 1 a la carte restaurant is free of charge (with prior reservation). One bottle of water is left in the minibar every day. Alacart Restaurants costs. 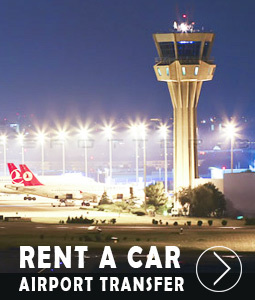 A minimum of 5 nights accommodation is available free of charge in 1 restaurant. Reservation is required in advance. Wireless internet (Wi-Fi) is available in public areas. There are rooms with built-in balconies, terraces or French balconies. There is no guarantee of closeness to public areas for all the rooms in the complex. The resort is not suitable for mobile guests. Side-by-side room guarantee is not provided. It is evaluated in case of availability. Access to the Palm Wings Beach Resort rooms starts at 14.00. The departure time from the rooms is no later than 12.00. All inclusive accommodation on a certified basis; starts with dinner and includes dinner until the number of nights you have stayed, and ends with lunch on the day of departure. In case the accommodation room is a special type of rooms such as a family room, a suite room (and so on), the fee is not made if any of the guests staying at the hotel leave prematurely. Unique place for your vacation. Beach is here, huge pool too. Very good animation team, who keep you in good mood. The food is fabulous. Honestly a piece of paradise. Recommend. Great hotel which is popular with tourists from many countries. Great pool area, and a wonderful beach location. Staff are mostly friendly and nothing is any problem to them. Food can be a bit bland but to be expected from an all inclusive resort. Worth a visit if you have a young family. Place is immaculate and loads of staff some of which are very friendly. There are 2 things I don't like no 1 the tiles round the pool are not designed for use round the pool they are lethal when wet l have seen 2 adults fall quite badly and I have to constantly be on watch with my 3 year old as she is always slipping as you would expect. It is something you should not have to worry about round a pool and has taken a wee bit of a shine of the pool as it is very good. The second is that quite a lot of the Turkish guests can be very rude and just walk in front when you are in a que and the people serving allow it and will ignore you even though you were there first. And they don't seem to control their children in the same way as you have to watch they don't take your pool toys and when they do the parents don't even make them give it back and if you did not notice would let them keep it. Lovely grounds with little bungalow rooms. Huge pool with loads of sunbeds beach towels so u dont have to bring your own. It was the best holiday we ever had. We enjoyed the quality and variety of food.The pool area and the beach was clean and kept well. The room is specially prepared for the guests who declare that it is a honeymoon couple during booking. For this reason, all couples who declare their reservation as a honeymoon couple are required to have a marriage voucher on the day of entry. Guests who have not registered their wallet and have passed 30 days of marriage are requested to pay for the room price for the honeymoon. Honeymoon Concept: On the day of entrance, a fruit basket and wine are served with a little decoration in the room.